An easy set of steps for running Equinox. 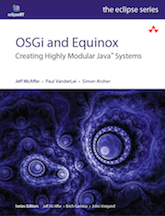 An easy set of steps for running Equinox to serve web content, serlvets and JSPs. An easy set of steps to set up an HTTP server using the Equinox bundles. Martin was integrating with pre-OSGi Eclipse but nonetheless ran into many similar problems. Very interesting stuff. An early adopter of this technology, in these articles Wolfgang motivates the building of Web UI components with OSGi.